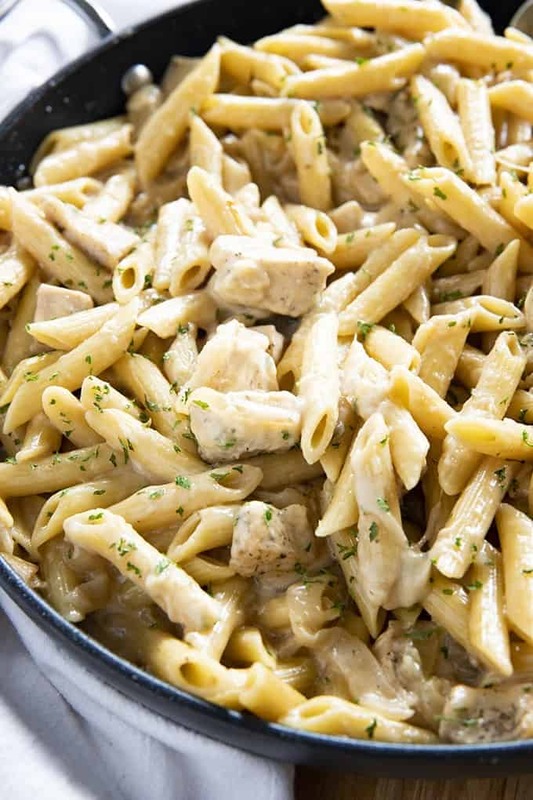 French Onion Chicken Pasta is an easy to make weeknight one pot pasta dish! 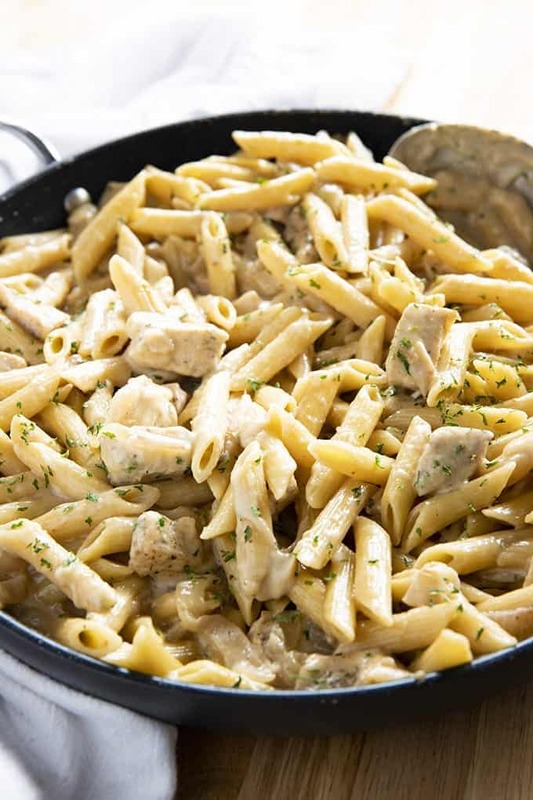 Full of tender chicken, caramelized onions, pasta, and gooey cheese! If you visit my blog on the regular, you’re probably aware that I’m obsessed with good old one pot/pan/skillet recipes. I love a no fuss dinner just as much as you guys! Follow along on Instagram with me as well, I’m planning to show you even more of what I’m cooking in my stories! 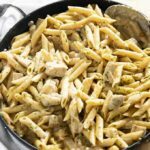 I am happy to say that I was super impressed with the flavors in this French Onion Chicken Pasta, we had it devoured in no time! French onion chicken is simply chicken that is cooked along with delicious caramelized onions in a delicious beef broth and coated with lots of melty cheese! 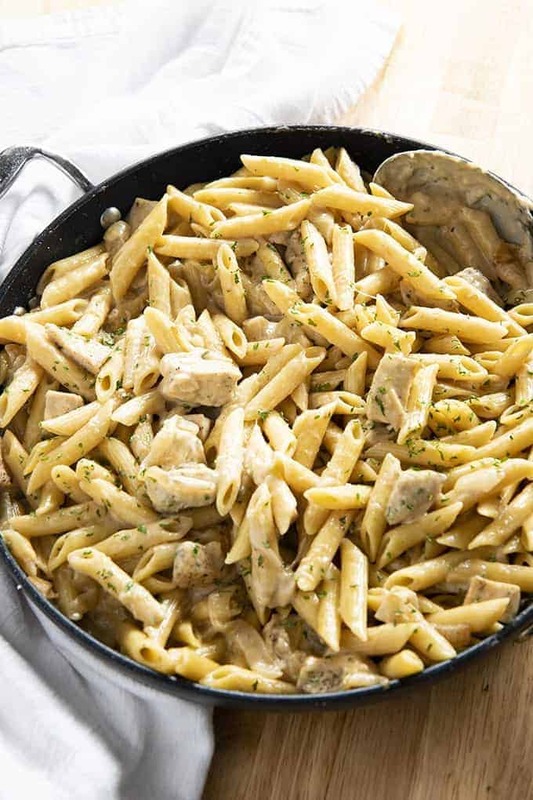 We add pasta to this recipe to make it a complete one pot meal. To make this French onion chicken pasta you start by caramelizing the onions. This process takes about 15-20 minutes, and is mostly hands off. You will melt your butter in a large skillet over medium heat, then, add the onions and allow them to cook down while stirring only occasionally. You will know the onions are done when they are a golden brown “caramel” color and nice and tender. Then, remove the onions from the pan to a bowl. You will brown the seasoned diced chicken on all sides, but it doesn’t need to be completely cooked through yet. Once the chicken is browned, add the onions back into the pan. Then, in goes the pasta and broth. Now, cook about 10-12 minutes until your pasta is tender. Most of the liquid will be gone from the pan. There will be a small amount of liquid left and that is ok, it makes for a super creamy sauce when you stir in the cheese! If you’re loving this one-pot dinner, be sure to try the rest of these! Add the onions and cook, stirring occasionally until onions are tender and caramelized. About 15 minutes. Remove the onions to a bowl. Season the chicken with the salt, pepper, garlic powder, and Italian seasoning. Heat the olive oil in the same skillet. Add the chicken to the skillet and cook and stir for 5 minutes until the chicken is seared on all sides. Add the onions back to the pan along with the pasta and beef broth. Bring to a boil and then simmer over low heat until most of the liquid is absorbed and pasta is tender. Stir in the heavy cream, provolone, and parmesan cheese. Any suggestions on how to use already cooked pasta in the recipe instructions? My husband declared this the best pasta ever! As I use chicken stock instead I add a splash of red wine for that rich flavor that or beef stock can only really add. I skip the cheese too just as I wanted to keep it as close to the soup would be itself and still just as yummy. Thanks! I made this and it was a huge hit. Thanks for the recipe. This was delicious my husband loved it! I was surprised that such a yummy rich dish was only 6 freestyle points per cup on WW. I used Ronzoni 150 cal high fiber penne. Thanks for a great recipe. 5 stars ….I couldn’t get the stars to change. Yep, this is going in our dinner rotation. I added mushrooms just because they are a favorite. This is a new favorite comfort food in our house! I’m wondering if you could use French Onion soup instead of broth, if so that would be tasty. What a flavorful dish! I love that I typically have the ingredients on hand to make this meal for dinner! Looks great! This will be perfect for easy dinners during the school year! This recipe was put together so well! I love recipes like this, as well. Thanks for sharing! Tomorrow is pasta night in our house and this French onion goodness needs to happen! It sounds so tasty! Oh my lands, this sounds like a perfect comfort dinner. Definitely adding this to my dinner list! Looks delicious! My family would love this! This sounds so simple! I cannot wait to try this! Can you convert this to instant pot please?